Summers in The International Economy. The National Confectioners Association estimates that 2005 Halloween sales were $2.1 billion, easily making Halloween the biggest candy season. This year, sales will certainly be higher. What percentage of those sales end up providing candy that individuals don't really like? If my own careful scientific study of Halloween bags is any guide, perhaps about 75 percent. It's not the dead that concern me about Halloween. And it is not the impact of all that sugar on the weight of our kids. No, it's the dead-weight loss, or pointless lost utility of the entire enterprise. That likely has a dollar value that exceeds $1.5 billion annually. American citizens squander more than a billion and a half dollars a year on an economically inefficient holiday. At least it's not as bad as Christmas. 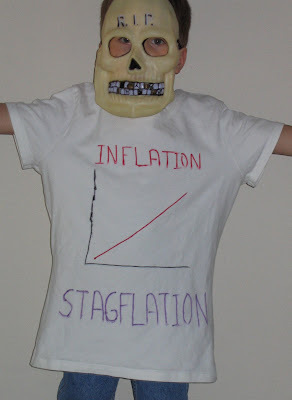 Economics professor Troy Quast emails me, "While I don't expect his costume to elicit any extra treats from my neighbors, I imagine the FOMC members might be startled to see my son at their front doors Halloween night." In the midst of all the chatter about the Rangel plan, a friend asks me how I would prefer to fix the looming AMT problem. My answer: A good place to start is the Report of the President's Advisory Panel on Tax Reform. Larry opines on the falling dollar. Because blogging is such a personal pursuit, with strong and immediate ego-rewards, it can be irrationally seductive, particularly to highly competitive overachievers. The hazard - and this applies as well to disciplines beyond economics - is that extraordinarily talented individuals may end up, like lab mice drinking sugar water, spending more time blogging than they should, even though their comparative advantage is smaller in blogging than it is elsewhere. Distorted by noneconomic but nonetheless powerful rewards, the idea market would become less efficient than it should be, and we'd all suffer as a result. The real danger, in other words, may not be that the "lemons" - the "tolerable bloggers" - will take over as the mainstays of the blogosphere but that they won't. Please stop blogging, Greg Mankiw. You have better things to do. The bottom three-fourths of households, those making less than $75,000 a year, are not much affected. They each would receive a tax cut of about $100 per year. The next 24 percent, those making between $75,000 and $500,000, would receive much more substantial tax cuts. Those in the $200,000 to $500,000 range, who are in the 96 to 99 percentile of the income distribution, would get a tax cut of about $3,600 per year. 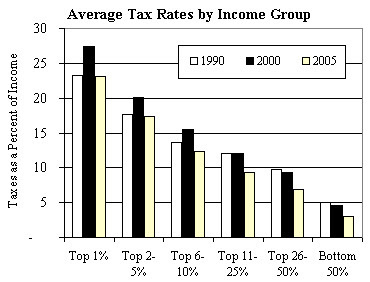 The top 1 percent, those making over $500,000, would pay substantially more in taxes. Those making more than $1 million would see their tax bill rise by an average of more than $100,000. Thus, as a first approximation, the plan increases the progressivity of the tax code by redistributing income from the very rich (e.g., CEOs, hedge fund managers, superstar athletes and actors) to the upper middle class (e.g., doctors, lawyers, congressmen). Where have all the oil shocks gone? Oil prices are near record highs, which raises a fascinating question. In recent years, the U.S. and world economies have typically shrugged off oil price increases. By contrast, oil price increases are a major part of the conventional story of the economic turmoil of the 1970s. Why the difference? The economy is far more energy-efficient today than it was in the past, in part because economic activity is based more on services and less on manufacturing. 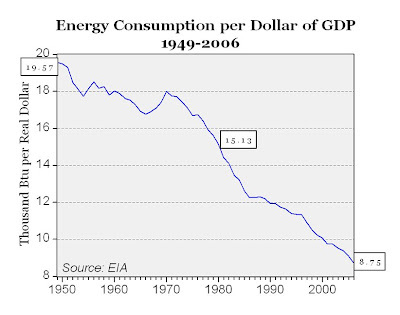 As a result, energy prices matter less today. In their research on the topic, Blanchard and Gali also give credit to more flexible labor markets, better monetary policy, and a bit of luck. Another hypothesis: The macroeconomic effect of high energy prices may depend on whether the high prices are the result of reduced supply or increased demand. Perhaps in the 1970s high oil prices were largely the result of supply restrictions, whereas in recent years high oil prices are driven more by increased demand from a booming world economy. One final conjecture: Maybe the recent increase in oil prices has been less sudden, making it easier for other prices and thus the economy to adjust. In particular, it may not have affected the skewness in the distribution of relative-price changes in the same way as previous oil shocks did. We have no shortage of theories. The definitive study on the macroeconomic effect of oil prices is still waiting to be written. Update: Lutz Kilian of the University of Michigan has a new paper on the topic. Lamont Café, the culinary provider of the undergrad library, serves a gargantuan cream puff. It’s as big as the palm of my hand and as thick as Mankiw's Principles of Economics. George Stephanopoulos: Let's bring up the point on social security. Barack Obama, taking advice from pundits and advisers to be tougher on Senator Clinton. Yesterday, he said she wasn't truthful on a number of issues. Social security was his number one issue. He said that senator Clinton has made a mistake to hedge and not say what she would do on social security. Clip of Barack Obama: Conventional thinking in Washington says that social security is the third rail of American politics. It says you should hedge and dodge and spin -- but at all costs, don't answer. I reject that notion. George Stephanopoulos: Paul, he rejects it and says he would lift the payroll tax on all income. You shake your head. Does that mean you think he's making a mistake? Paul Krugman: Social Security, if you go through the federal government, piece-by-piece, and see which programs are seriously underfunded and which are close to being completely funded, social security is one of the best. It's not for certain that social security has a problem. And it's something that the right has always wanted to kill, not because it doesn't work but because it does. And Obama to go after this program, at this time, you have to wonder. All of my progressive friends are saying what on earth is going through his mind to raise this issue. Maybe Senator Obama was persuaded by this point of view on the topic. Christian Zimmermann informs me of the new RePEc blog, which is focused on the dissemination of economic research. Ways and Means Chairman Charlie Rangel has proposed a bill dubbed "the mother of all tax reforms." It includes repeal of the AMT, a substantial increase in the top marginal tax rate on individual incomes, and a cut in the corporate tax rate. On the corporate side: that is the one part of the bill I thought was going to support the general notion of lowering the rate and broadening the base. It certainly fell short of my expectations. Base broadening is not an end in itself: we want to broaden the base by eliminating ineffective preferences, where some things are getting better treatment than competing activities. Some stuff in the bill does do that. But some stuff does not make sense from an economic efficiency perspective. The one thing that jumped out at me was the repeal of LIFO . All studies we have of effective tax rates show even with a significant fraction of inventory getting LIFO treatment they are being taxed more heavily than equipment or structures. It encourages firms to hold more equipment and less inventory, it distorts the choices of firms. The bill would aggravate the differences. It’s a significant increase in the tax burden on inventory. The whole notion of this approach to corporate tax reform is you’ll have more of a level playing field across investments. But this provision takes the stuff already being taxed more than everything else and piles more burdens on it. Another bad provision: the bill would increase the tax on intercorporate dividends, where one corporation holds stock in another corporation [except] if it’s like a wholly owned subsidiary. That makes no sense. It says the tax burden on investment will depend on how many corporate layers there happens to be. There’s no rational distinction, no efficiency gain, no equity gain in taxing that more heavily. Some of the stuff in here does follow the philosophy that I was hoping to see: [repeal of] this domestic/international sales corporation which tries to promote exports, which is unsound policy. That’s just mercantilism. It’s good to see the bill scrapping that. For those tax geeks out there who want to read more about LIFO accounting, click here. But trust me: this topic is not for the faint of heart. House Republicans plan to introduce a conservative alternative to the Rangel alternative to the Alternative Minimum Tax. The GOP measure would repeal the AMT, and make up for the $65 billion in lost tax payments by levying a 4.6 percent surcharge on Americans who download alternative rock music through iTunes. House Speaker Nancy Pelosi immediately condemned the Republican proposal because, she said, “It places an unfair burden on people who already carry the weight of the world on their shoulders." The Christian Science Monitor joins the Pigou Club. Can food shortages be far behind? The basic economics here is straightforward, but apparently it is not widely enough understood among the general population to make this kind of policy a political loser. The city, not the animal, with some broad lessons for urban policy. Appropriations for U.S. Operations in Iraq and Afghanistan and for the War on Terrorism (Billions of dollars), according to the Congressional Budget Office. An article by Terry Fitzgerald from the Minneapolis Fed (via Econlog) asks, Has Middle America Stagnated? It does a good job explaining why one should be wary of data on Average Hourly Earnings. If we could pour a five-gallon bucket’s worth of sulfate particles per second into the stratosphere, it might be enough to keep the earth from warming for 50 years. Tossing twice as much up there could protect us into the next century. A 1992 report from the National Academy of Sciences suggests that naval artillery, rockets and aircraft exhaust could all be used to send the particles up. The least expensive option might be to use a fire hose suspended from a series of balloons. This proposal is well beyond my ken, but I wonder about unintended consequences. Recently, I was in downtown Wellesley, in my favorite local bookstore, Starbucks latte in hand, browsing through the new offerings, when I stumbled upon Robert Reich's new book, Supercapitalism. As I stood in the store, I did what every narcissistic Harvard professor (yes, I am being redundant) does: I looked myself up in the index. CEOs are paid what they are worth to their companies, and their high pay reflects the extraordinary value of their talent. But the supply of talent is inelastic, and the allocation of talent would not be affected if everyone faced high tax rates. The quotation is taken as support for Reich's broader argument that we should increase taxes on high incomes. He mentions that the quotation is from this blog, but he also cites a David Wessel article from the Wall Street Journal as a source. In his model, high CEO salaries are pure economic rents. CEOs are paid what they are worth to their companies, and their high pay reflects the extraordinary value of their talent, but the supply of talent is inelastic, and the allocation of talent would not be affected if everyone faced high tax rates. Notice the key phrase "in his model." That is, I was not describing any evidence on the question, nor was I even giving my opinion. Rather, I was describing a particular model presented at a Harvard seminar by Xavier Gabaix on his joint work with Augustin Landier. In Reich's defense, Wessel's article does not include the key qualifier either. Wessel's article does note, however, that "Messrs. Gabaix and Landier shudder at this suggestion [of higher tax rates]." Reich omitted that part of the Wessel article from his footnote. A reasonable interpretation is that Gabaix and Landier made the assumption of inelasticly supplied talent to keep their model simple, not because they really believe it. Gabaix and Landier make a modelling assumption for purposes of analytic convenience. I describe their model and its implications on this blog. Wessel quotes part of that description in the Journal. Reich reads the Journal and cites me as an authority using the partial quotation. As a result, a modelling assumption morphs into an established fact. You might call that data-free empirics. From the Pluralist Economics Review. the meager tax take leaves the United States ill prepared to compete. From universal health insurance to decent unemployment insurance, other rich nations provide their citizens benefits that the United States government simply cannot afford. The consequences include some 47 million Americans without health insurance and companies like General Motors being dragged to the brink by the cost of providing workers and pensioners with medical care. Employer-provided health insurance is just a form of compensation that happens to be provided in kind rather than in cash. What the Times seems to be saying is that because companies like General Motors have promised levels of compensation too large to make them competitive in the international marketplace, we should shift the responsibility for some of that compensation from the companies to the taxpayer. An alternative approach is for the companies to reduce compensation to levels they can afford. One might respond that reduced compensation would be hard on workers. But so would the higher taxes needed to pay for the national health insurance the Times is lobbying for. There is no free lunch here. Reasonable people can disagree about the case for national health insurance. But in that important discussion, concern about international competitiveness is at best a non sequitur. Stanford's David Kennedy reviews the new book by Princeton's Paul Krugman. Congress should provide a 39-cent tax credit for every dollar of American investment in developing countries. If Company X were to build a $100 million factory in Madagascar, its tax bill would be reduced by $39 million....Using tax credits instead of traditional foreign aid also means that the money will be spent more prudently. Because for-profit companies are focused on the bottom line, they will be more protective than government agencies of the money they invest in developing countries. I appreciate the logic here. They might even be right that this approach would be more effective than traditional foreign aid. Imagine what would happen, however, if a political candidate of either party were to come out in favor of the proposal. The opposition would quickly lambast it as the "outsource American jobs to third-world sweatshops tax credit." Brad DeLong says I am efficient. Listen to interviews with a variety of great economists, including Ken Arrow, Stanley Fischer, Austan Goolsbee, Paul Krugman, Amartya Sen, V.V. Chari, Tom Schelling, Paul Samuelson, and Drew Fudenberg. The journal Economic Inquiry has appointed a humor editor. The senator opposes a measure that many environmentalists desire, a carbon tax, most likely as another gasoline tax. He told the warming and energy conference that he generally opposed new taxes but that he also believed that poor workers who tended to commute to work longer distances would be disproportionately affected. Senatator McCain, it seems, has not been fully briefed on the economic impact of cap-and-trade. Like a carbon tax, a cap-and-trade system would put a price on carbon and raise the price of carbon-intensive products. At least a carbon tax would raise some tax revenue, so other taxes could be cut to offset the distributional impact of the higher prices. A cap-and-trade system would not raise revenue to fund a compensating tax cut, unless the carbon allowances were auctioned, in which case the system would be effectively a carbon tax. The bottom line: Those poor workers commuting to work are no better off under cap-and-trade than they are under the carbon tax. What’s fair? I’d say a 50 percent marginal tax rate on the very rich (earning over $500,000 a year). Plus an annual wealth tax of one half of one percent on net worth of people holding more than $5 million in total assets....If the Democrats stand for anything, it’s a fair allocation of the responsibility for paying the costs of maintaining this nation. I don't agree with the policy, but I appreciate how forthright he is about his policy preferences. the optimal system for most redistributional preferences consists of a large demogrant that is rapidly taxed away for low income taxpayers, with lower marginal rates at higher income levels. Realistic optimal tax problems don't usually yield solutions similar to Reich's proposal, even for a social planner who has strong preferences for equality. High tax rates at the top generate a lot of deadweight loss for each dollar of tax revenue. In most standard optimal tax models, a more redistributionist social planner would give more to the poor and impose higher marginal tax rates on everyone, but she would not focus disproportionately on the the very top of the income distribution. And she would not add an extra penalty to capital accumulation, as Reich is proposing. My favorite textbook now in Azerbaijani. The IMF research director has a blog. Smith College. Click and scroll down for info about my talk. Update: I had a great time at Smith: smart earnest students, dedicated faculty, beautiful campus, and a charming college town. This graphic, from the homepage of the Congressional Budget Office, shows estimated year-to-year growth rates in federal outlays and receipts. The figures do not correct for inflation, nor do they take into account population growth or economic growth. A natural comparison is to the growth rate in nominal potential GDP, which is about 5 to 6 percent. For example, in 2005 and 2006, outlays were growing faster than this benchmark, so the government was growing relative to the economy. In 2007, outlays were growing less rapidly, so government's share of the pie was shrinking. the federal budget deficit was about $161 billion in fiscal year 2007, $87 billion less than the shortfall recorded in 2006. Relative to the size of the economy, that deficit was equal to 1.2 percent of gross domestic product, down from 1.9 percent in 2006. For comparison, note that the average budget deficit over the past forty years is about 2.4 percent of GDP. Of course, there is still a looming long-run fiscal gap. The short-run fiscal picture, however, does not look historically anomalous. My Harvard colleague Al Roth visits Google and talks about Market Failure and Market Design. The video takes about an hour. Some of you have noticed that the comments section is gone. I disabled that feature of the blog. A friend has asked me to explain why. This blog started on a lark. It was originally set up for my students in ec 10. After a few weeks, however, the existence of this blog became more widely known, and the readership started to grow. One day last week, more than 20,000 visitors stopped by. 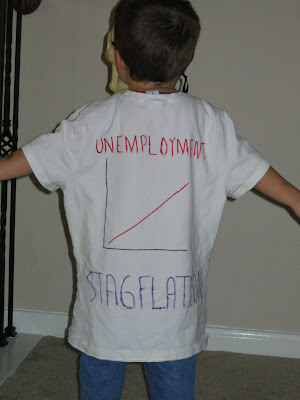 This is now one of the top economics blogs, and it is one of the few that are free of advertising (well, almost free of advertising). The blog is sometimes even quoted in the mainstream media (such as in this recent NY Times article). All that is gratifying, but it is also time-consuming. In addition to this blog, I have classes to teach, students to advise, papers to write, textbooks to update, and three children to raise. Oh, yeah, my wife likes to see me now and then, too. It is fair to say that among all those activities, this blog ranks as my last priority. To put it simply, this blog is a hobby. My late colleague Zvi Griliches collected coins; I blog. As far as I can tell, Zvi never let his hobby interfere with the rest of his life. I am trying to do the same. The comments section has been, for me, a source of both fun and frustration. Originally, I had hoped that it might provide a way for my students to debate one another on economic issues. It never quite worked out that way. Some of my current and former students did participate (and shared with me, privately, their sometimes odd screen names). But a vast majority of the commenters fell outside this category. The growth in the comments section was fine with me, as long as the discussion remained civil. Mostly it was, and I learned a lot from the comments. But unfortunately, a few (usually anonymous) commenters too often crossed the line. I just don't have the time to police comments and enforce good behavior, especially since some posts were generating more than 100 comments. And I don't want to host a party in which a small vitriolic minority consistently tries to ruin the event for everyone else. So I decided to turn the comments feature off. The absence of comments may deter some readers from coming by. I hope not. But if attendance falls off a lot, I will start looking for another hobby. Maybe golf. GMU economist Alex Tabarrok offers his take. Source. Click on the above graph to enlarge. Data note: According to the BEA, "personal current taxes are tax payments (net of refunds) by persons that are not chargeable to business expense and certain other payments that are made by persons to government agencies (except government enterprises) that are treated like taxes. Personal taxes includes taxes on income, including realized net capital gains, and on personal property. Contributions for government social insurance is not included. Personal current taxes are used in the derivation of disposable personal income, which is calculated as personal income less personal current taxes." You gotta love a guy whose idea of an important life lesson is: “I have always argued that an up-to-date set of the most detailed estimates for the latest available quarter is far more useful for forecasting accuracy than a more sophisticated model structure.” Words to live by. Mike thinks Alan is being hopelessly geeky here. But I think Alan is talking to geeks like me, and also those who used to work for him on the staff of the Federal Reserve. Modern macroeconomists have spent a lot of effort trying to develop better models of the economy for forecasting and policy analysis. Just look at any issue of the Journal of Monetary Economics or the Journal of Money, Credit, and Banking. Alan seems to be saying that our efforts have, to some degree, been misdirected. Better monetary policy, he suggests, is more likely to follow from better data than from better models. Relatively little modern macro has been directed at improving data sources. Perhaps that is a mistake. Ben gives a talk on The Recent Financial Turmoil and its Economic and Policy Consequences. Most economic research is not terribly useful for making better decisions regarding personal finance. Here is an exception. In a new paper, Sumit Agarwaland, John Driscoll, and David Laibson provide a relatively simple closed-form solution to the problem of when to refinance one's mortgage to save on interest payments, taking into account uncertainty and the option value of waiting. They also provide an online calculator to make it easy for people to use the new method. This year's Nobel Prize in economics goes to Leonid Hurwicz, Eric S. Maskin, and Roger B. Myerson. Eric used to teach economic theory at Harvard and was a great teacher and colleague. If my recollection is correct, when he moved from Harvard to the Institute for Advanced Study in Princeton, he bought the house Albert Einstein used to live in. I wonder if there are any other houses that can claim two (unrelated) Nobel laureates. Just a comment on your blog posting about Laureate housing: Frank Wilczek (2004 Physics Laureate) also used to live in Einstein's house. I think he moved to MIT a couple of years before getting the Prize, though. If all this is true, that house should command quite a premium among local academics. I am going to ask Eric if, next time he is on vacation, I can house sit just to soak up the karma. Marty Feldstein applauds the falling U.S. dollar. Is our sense of fairness genetic? An international team of researchers including an MIT graduate student has demonstrated for the first time that genes exert influence on people's behavior in a very common experimental economic game. The paper, published in the Oct. 1 advanced online issue of the Proceedings of the National Academy of Sciences, looked at the ultimatum game, in which a proposer makes an offer to a responder on how to divide a sum of money. This offer is an ultimatum; if the responder rejects it, both parties receive nothing. Thanks to Mark Thoma for pointing out the source article. German researchers have demonstrated chimpanzees make choices that protect their self-interest more consistently than do humans.Researchers from the Max Planck Institute of Evolutionary Anthropology in Leipzig studied the chimp's choices by using an economic game with two players. In the game, a human or chimpanzee who receives something of value can offer to share it with another.If the proposed share is rejected, neither player gets anything.Humans typically make offers close to 50 percent of the reward. They also reject as unfair offers of significantly less than half of the reward, even though this choice means they get nothing. The study, however, showed chimpanzees reliably made offers of substantially less than 50 percent, and accepted offers of any size, no matter how small. The researchers concluded chimpanzees do not show a willingness to make fair offers and reject unfair ones. In this way, they protect their self interest and are unwilling to pay a cost to punish someone they perceive as unfair. The study appeared in the Oct. 5 issue of the journal Science. The sense of fairness demonstrated by the ultimatum game is apparently genetic and intrinsically human. 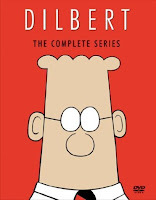 D. also brings acclaim to himself as a profound, far-sighted, truth-telling guru. Maybe you think it's Al Gore, and if so, you are correct. But I also have in mind the supply-side economists of the 1980s. The more I think about it, the more similar Al Gore and the supply-siders appear. They both overstated the scientific consensus (if we do nothing, temperatures will rise so quickly that sea levels will increase twenty feet; if we cut tax rates, the economy will grow so quickly that tax revenues will rise rather than fall). 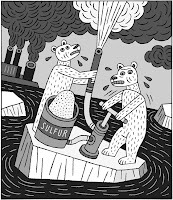 They both were alleging to convey a scientific message, but drew more attention to themselves than their scholarly contributions warranted (neither Al Gore and Arthur Laffer became known for their numerous highly cited peer-reviewed publications). They both ended up more famous as a result (a Nobel prize, an eponymous curve). They both infuriated those on the opposite side of the political spectrum (the right has about as much respect for An Inconvenient Truth as the left has for supply-side economics). But, through it all, they both educated the public about something important (according to the best evidence, both carbon emissions and high tax rates are true problems which we should avoid to the extent we can). Herb Stein once said, "There is nothing wrong with supply-side economics that division by ten wouldn't fix." I thought of this quotation when I saw Al Gore's movie. The more I think about it, the more I realize how parallel these two efforts of public education, or perhaps political propaganda, really are. Data are total federal income taxes divided by adjusted gross income. Pigou Club member wins the Nobel Peace Prize. Pigou Club founder talks today at the University of Connecticut. Bruce Ackerman and Anne Alstott of Yale Law School defend the new entitlement suggested by Hillary Clinton. Update: Clinton's new stand on baby bonds: Never mind. Is academia serious about diversity? the extent of the imbalance and some informal research he has conducted “give me pause” and has him wondering about the possibility of bias against right-leaning thinkers. He examined the scholars being asked to give Tanner Lectures (a top lecture series at leading universities) and the political leanings of economists and political figures among honorary degree recipients at a top university (which he declined to name). Liberals receive more such honors by far, he said. Thanks to George Borjas for the pointer. Question to think about: If right-wingers are underrepresented in universities relative to the population and discriminated against by the left-wing majority, as Larry suggests, should there be affirmative action for right-leaning academics? It seems that, on principle, those on the left (who favor affirmative action to promote diversity and correct past injustice) should endorse such a university policy, and those on the right (who more often oppose affirmative action) would be against. [Paul] advances his viewpoint not by misstating facts but by omitting those parts of the past that make history messier. The Federal Reserve Bank of Cleveland offers a useful service: A prediction of future Fed decisions, as judged by the prices of Fed funds options. It is updated every business day. Intrade has set up a trading market for the Nobel Prize. Scroll down for the economics award. There is no trading yet, but soon it will provide a way for my senior colleagues to hedge the risk. Individual mandate supporters typically justify the policy by citing the problem of uncompensated care. When uninsured patients receive health services but don't pay for them, the rest of us end up footing the bill one way or another. So advocates of insurance mandates contend, plausibly enough, that we should make the free riders pay. But how big is the free-rider problem, really? According to an Urban Institute study released in 2003, uncompensated care for the uninsured constitutes less than 3% of all health expenditures. Even if the individual mandate works exactly as planned, that's the effective upper boundary on the mandate's impact. Here is Whitman's longer piece on the topic. 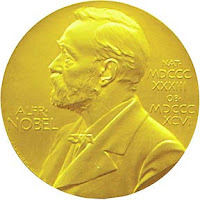 It is Nobel speculation time, and a reader asks me who I expect to win. Let's look at the facts. The best objective measure of scientific influence is citations. I have heard all the objections to such crude measures, and I will admit that citation rankings are imperfect. But subjective judgments are imperfect too, and often much more so. Moreover, as a purely predictive matter, highly cited economists usually get the prize eventually. In this old citation ranking, the top five most cited economists are all Nobelists. As of today, the prize has gone to more than half of the top 30 (and some of the others may win it in the future). Based on citations, who is in line to get the prize? In that old ranking, the top two on the list who have not yet won the prize are Fama and Feldstein. In this somewhat more recent citation ranking, the top two economists are Fama and Barro. In this most recent ranking, the top two are Barro and Shleifer. Thus, if I had to bet a dollar on this year's prize, I would put it on Fama, Feldstein, or Barro. Andrei, who is still in his 40s, will have to wait a few more years. But as long as he lives long enough, he is a sure thing. Update: Here are the predictions of Thomson Scientific, the guys who maintain one of the citation databases. Update 2: None of my bets won, although I remain confident that they will in the years to come. FYI, in this citation ranking, Eric Maskin is number 106 and Roger Myerson is number 96. When parents decide to have kids, they are creating a massive benefit for their children. As much as parents may love their children, they are unlikely to reap all the benefits those children will offer during their lives. Economists often think that it makes sense to subsidize behavior that generates big "external" benefits for others: parenting seems like a particularly natural example of such behavior. The pragmatist in me recoils at this argument. Ed is implicitly comparing the utility of having been born with the utility of never having been born. But since we do not observe those people who were never born, how can we possibly know their utility? Any theory that relies on things that are intrinsically unobservable (such as the utility of potential people who were never even conceived) seems suspect as a basis for public policy. Update: Ed emails me some background: "If op-eds included citations, I should have cited Becker and Murphy's Journal of Law and Economics paper on the family and the state that makes this case quite explicitly." I am too busy hanging out with Al Gore and Spike Lee. Think you know who's going to win the Nobel prize in economics? Have a dollar you can afford to lose (to a charity to be named later)? If you answered "yes" to both questions, then click here. For some speculation from last year, click here and here. he is ready to challenge the European Union to get a quota on foreign players within European teams. I wonder: How many of the Boston Red Sox are native Bostonians? Thanks to ec teacher extraordinaire David Johnson for the pointer. That's how many visits this blog has had since it started up in spring of 2006. (You can scroll down to see the sitemeter on the right margin for the most up-to-date count.) Thank you all for coming. I have a theory: Daron Acemoglu has a secret identical twin. No single person, even as brilliant as Daron, can possibly be as productive as Daron appears to be. The latest evidence for my theory: Daron's new book Introduction to Modern Economic Growth. It is a scant 1,169 pages, and from what I have read of it, it looks fantastic. The text will become the new standard for the next generation of growth economists. But now that a draft of the book is complete, I think it is time for Daron to let his secret twin out of the attic. George Will profiles Barack Obama's economic adviser. Thanks for voluntarily subjecting yourself to the Fairness Doctrine. Last week Senator Grassley, the Republican ranking member of Senate Finance, got so angry about the White House’s description of the SCHIP legislation that he said the President’s “understanding of our bill is wrong, and I would urge the president to reconsider his veto message based upon the bill we might pass, not something that some staffer has told him wrongly about our bill.” I have to agree. (1) The President supports a proposal that would reduce annual spending on SCHIP relative to inflation and reduce the number of covered children and pregnant women by 840,000 according to the Congressional Budget Office (CBO). You might ask how the $5 billion increase in spending over 5 years promised by the White House could result in more uninsured. The answer is that for technical reasons the CBO baseline assumes $5 billion in nominal dollars annually going forward, something depicted in the flat green line in your previous post. But spending at this baseline would fall relative to general price inflation and plummet relative to health spending growth. As a result, under CBO’s baseline the number of people covered would fall from 7.4 million in 2006 to 3.5 million in 2017, despite an increase in the eligible population. (2) The Democrats and a substantial number of Senate Republicans support a proposal whose principal focus is covering low-income children who are currently eligible (3.2 million according to CBO) plus expanding coverage modestly to new children (600,000 according to CBO). In total 85 percent of the coverage expansion is for those who are already eligible but are not getting coverage either because the funding limits assumed in the baseline are projected to be reached leading states to turn away currently eligible children or because families simply do not sign up for the coverage that is available to them. (3) Although the SCHIP legislation is typically described as “costing” $35 billion, much of this sum is needed simply to maintain the current enrollment and service levels. Democrats insisted that the entire $35 billion be paid for without increasing the deficit. This was significant because some in the party were arguing that there was no need to pay for the portion of the $35 billion that covers the continuation of current service levels, just like Republicans argue that there is no need to pay for the extension of tax cuts. And to continue on the subject of fiscal responsibility, it is indeed unfortunate that the SCHIP bill has a cliff after 2012 (although it’s an odd accusation for supporters of the 2001 and 2003 tax cuts to be making). It is, however, important to realize that the cliff wasn’t in the original House bill which helped pay for the SCHIP expansion with $50 billion over five years in Medicare spending cuts along the lines recommended by Congress’ bipartisan Medicare Payments Advisory Commission (MedPAC). Senate Republicans insisted on taking out the Medicare spending cuts, leaving behind a cliff in net spending. But as long as PAYGO is still in force five years from now the extension will again have to be paid for, hopefully next time with many of the spending cuts originally supported by House Democrats. This bipartisan bill refocuses the program on low-income children. It phases adults off the program. It prohibits a new waiver for parent coverage. It reduces the Federal match rate for States that cover parents. It includes new improvements to reduce the substitution of public coverage for private coverage… The compromise bill discourages States from covering higher income kids by reducing the Federal matching rate for States that wish to expand eligibility over 300 percent of Federal poverty limits. It rewards States that cover more low-income kids by providing targeted incentives to States that increase enrollment for coverage of low-income kids. You believe in a smaller government. But in this case there’s no free lunch. The White House veto will deliver a smaller government but at the cost of a reduction in the number of currently eligible low-income children covered by SCHIP and an increase in the number of uninsured. You might have better ideas about to reduce the number of uninsured children. But I have a hard time seeing how a Presidential veto could be one of them. This past weekend the President signed a short-term extension of a program that finances health insurance for children, called SCHIP: the State Children's Health Insurance Program. We expect the Congress today will send the President HR 976, a bill that "reauthorizes" SCHIP for five years. The President has said he will veto this bill, and we expect the House will attempt to override the veto. This debate is generating much heat and little light. Our critics claim that, because he opposes this bill, the President doesn't want to help poor kids. That is of course untrue, so let's look at where we agree with this bill, where we disagree, and what we would do differently. 2. We agree with the Congress that there should be no funding gap while we attempt to resolve our differences. At the same time we're "aggressively debating" the right long-term solution, it's encouraging that we have agreed not to allow funding to lapse in the short run. Last weekend the President signed a bill that will keep funding going to States through mid-November. 3. We think the "C" in SCHIP stands for "children". Over the past several years, adults have been added to SCHIP. Some were parents of kids with health insurance, others were adults without children. We were responsible for some of those additions, as we approved State waiver requests. We made a policy shift this year, based in part on further input from the Congress, and we're now returning SCHIP to its original purpose. Over the next few years, our policy will return SCHIP to a kids-only program. States that are now covering adults will have to move them onto Medicaid or a State program. While the advocates for HR 976 argue they share this goal, the bill doesn't match the rhetoric - it lets adults in some states back into SCHIP. And in six States (IL, NJ, MI, RI, NM, and MN), more than half of their projected SCHIP expenditures this year are for adults. We think this is the wrong direction for a program that should be about children. This is a fundamental philosophical difference - should we collect more taxes to subsidize those in the middle class, or fewer taxes and subsidize only the poor? The President wants to focus Federal tax dollars on helping kids in families with incomes below twice the poverty line. Note that in the current debate, they count as "poor" kids. We created a lot of heat by sending a letter from the head of the SCHIP program, Dennis Smith, to State Medicaid Directors. Basically, Dennis' letter says to States, "You can't expand your program to non-poor kids until you've demonstrated that at least 95% of poor kids in your State have coverage." Amazingly, this simple insistence that we help poor kids first is considered controversial. New York has announced they're going to sue CMS. Should a childless Kansas couple with $50K of income pay higher taxes to subsidize health insurance for a New York family with two kids and $80K of income, when the Kansas family may be having trouble affording health insurance for themselves? We think not. Congressional advocates for HR 976 argue that we have been misrepresenting HR 976 - they argue that the bill does not provide extra federal funding for all kids up to 400% of poverty. To be clear, it does not, nor have we claimed that it does. The bill does, however, provide extra federal funds to subsidize some kids who are not poor. In New York, kids up to 400% of poverty would be eligible and the State would be paid extra to enroll these kids. For a family of four, this is $82,600 of annual income. In New Jersey, kids up to 350% of poverty would be eligible and the State would be paid extra to enroll these kids. For a family of four, this is just over $72,000. In all other States, kids up to 300% of poverty would be eligible and the State would be paid extra to enroll these kids. For a family of four, this is just over $62,000. (mostly) for free. The Congressional Budget Office estimates that under HR 976, 2 million of the 5.8 million new people enrolled in government health plans would drop private insurance to enroll. 6. We don't think you should raise taxes to pay for more spending. 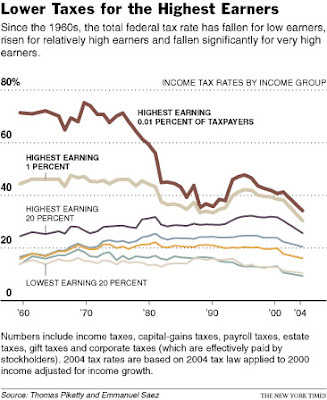 And tobacco taxes are regressive - they fall hardest on low-income people. 7. We think this bill is fiscally irresponsible, because it creates an unfunded and unsustainable set of promises. As you can see from the graph below, HR 976 would increase spending by 121% over five years. But it would then cut spending 65 percent over two years, to below where it is now. This is clearly unrealistic. Once the expectation is created among individuals and the States for $14 B / year of spending, the likelihood that the Congress would actually allow a 65% funding cut is near zero. In reality, the actual projected spending probably looks like this. The bill doesn't pay for this increased spending in the "out years", because technically it assumes the big cut after 2012. So it raises taxes by "only" $73 B over ten years, when a more realistic long-term spending assumption would require even higher taxes to offset the increased spending. 8. We believe this is a step toward a government-run system for all Americans. The President has made clear that he believes this is the wrong direction. He prefers a system in which the patient (and consumer) is at the center of decisions about his own health care. Moving toward more government financing, and more people in health plans chosen by the government, means less control for the patient, and more decisions made in Washington and in State capitals. This is bad. In contrast, the President has worked with the Congress to enact changes that give patients more choices and more control over their health care (competing private Medicare drug plans, competing Medicare Advantage insurance plans, Health Savings Accounts), and he has proposed a host of other changes that move in the same direction (especially Association Health Plans, allowing people to buy insurance across state lines, and changes to the tax code, described below). 9. We believe we have a better way to help more people afford private health insurance, at less cost to the taxpayer. The President proposed a change to the tax code which would create a "Standard Deduction for Health Insurance". When combined with the President's SCHIP proposal, this Standard Deduction would result in significantly more people being able to afford (and buying) private health insurance. His proposals would combine direct assistance (through SCHIP) for poor kids, and a voluntary tax incentive for most everyone else. I'll try to describe that in more detail in a future blurb. One House Democratic leader said that a Presidential veto would be a "political victory" for the Democrats. We're looking for those who are instead more interested in finding common ground with us on a responsible policy to help poor kids get health insurance, and to making health insurance more affordable for all working Americans. Economists do not have a good theory of tipping. Normally, we assume that consumers pay as little as they have to when buying the products they want. Yet, when buying meals, haircuts, and taxi services, most consumers voluntarily pay more than they are legally required. Why does this happen? Why is it more true for some services than for others? Why do tipping customs vary from country to country? I have no idea. The rock band Radiohead is putting this phenomenon to the test: You can buy the download of their latest album for whatever price you choose. You can pay as little a penny or, they hope, much more. The whole price you pay is, in essence, a tip (but paid before the service is rendered). Since we economists don't understand tipping, we can't really say whether this new scheme will work. But if it does, during my next ec 10 class, I will put a hat next to the lectern. Scott Adams, creator of the great comic strip Dilbert, explains how economics changes your brain. Thanks to Bryan Caplan for the pointer.